Just before noon yesterday, February 19, a long-awaited plume of dust rose into the air on the SR-99 Alaskan Way Viaduct Replacement project, in Seattle, marking Bertha’s slow and successful breakthrough into her repair shaft. Having been stranded underground for more than a year, the damaged 57.5ft (17.52m) diameter Hitachi Zosen EPB machine began mining through the 20ft (6m) unreinforced concrete wall of the access pit on Tuesday night. As a precaution, Seattle Tunnel Partners (STP) – the project’s design-build contractor – operated Bertha at a conservative 1 foot (0.3m) per hour, one-sixth its normal design speed, to maximize the machine’s ability to mine through the concrete while operating with a damaged bearing seal system. STP had anticipated that the machine could overheat, as it has done during recent attempts at mining. However, temperatures this week reached only 86 degrees (30°C) at the bearing, far below the 140-degree (60°C) limit Hitachi set for the operation. The machine will continue to move forward, stopping to build rings on its way into the shaft, until the front end of the machine is fully exposed. 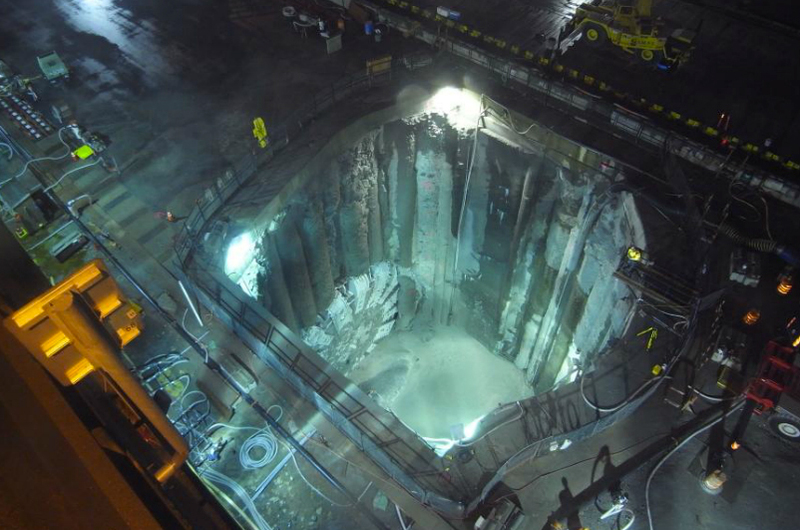 Based on the current pace, with crews working two 10-hour shifts per day, the world’s largest TBM should reach the center of the pit within a couple of days, allowing for the front end to be dismantled and the cutterhead and drive unit to be hoisted to the surface for repairs. A bespoke Mammoet modular lift tower will conduct the 4 million-pound (1,815 ton) lift. Hitachi is paying for the machine repairs under warranty. For now, STP partners also are paying for the excavation of the pit, and the crane to lift the machine.